DUBLIN, Ireland – Physical and sexual abuse was endemic in Irish institutions for boys run by religious between 1940 and the late 1970s, said an independent commission report. A report released May 20 by the Commission to Inquire Into Child Abuse said a climate of fear created by pervasive, excessive and arbitrary punishment permeated most of Ireland’s institutions for children and all those run for boys. Children lived with the daily terror of not knowing where the next beating was coming from, said the report. In addition to being hit and beaten, witnesses described other forms of abuse such as being flogged, kicked and otherwise physically assaulted, scalded, burned and held under water. Witnesses reported being beaten in front of other staff, residents, patients and pupils as well as in private. The commission of inquiry, established in 2000, was chaired by High Court Justice Sean Ryan and included prominent social workers, a pediatrician, a clinical psychologist and a representative of a children’s charity. At the Christian Brothers’ school Letterfrack, “physical punishment was severe, excessive and pervasive and, by being administered in public or within earshot of other children, it was used as a means of engendering fear and ensuring control,” the report said. The 2,600-page report said sexual abuse was reported by approximately half of all those who testified before a confidential committee of the independent commission. Although girls were subjected to predatory sexual abuse by male employees or visitors, sexual abuse was not systemic in girls’ institutions, the report said. Sexual abusers often were repeat offenders, said the report. The commission found that, contrary to religious orders’ claims that the recidivist nature of sexual offenders was not understood, it was clear from the documented cases that religious were aware of the propensity for abusers to continue to abuse. More than 90 percent of all witnesses who gave evidence to the confidential committee reported being physically abused while in schools or out-of-home care. The report said regulations governing the use of corporal punishment were disregarded with the knowledge of the Irish Department of Education, which had legal responsibility under the Children Act 1908 for all children committed to industrial and reformatory schools. It said although the education minister had the power to grant and withdraw certification, the department had too little information because the inspections were too few and too limited in scope. It also said the department’s deference to religious congregations impeded change. The report said school officials were alerted in advance to state inspections, so government officials did not get an accurate picture of conditions. It said inspectors ignored regulations that required punishment books to be kept and made available for inspection. The report recommended that counseling and educational services should be made available to victims, many of whom never received a secondary school education, and family tracing services should be made available to help people who lost their identities in the process of being placed in institutional care. It said future government child-care policies should make the needs of the child paramount and should be reviewed on a regular basis. The Irish government established the independent commission in 2000 to hear evidence from anyone alleged to have suffered child abuse at institutions since 1940. 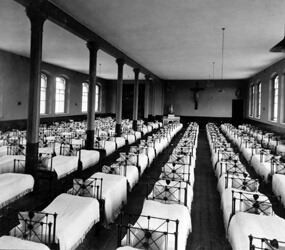 These institutions, funded by the state but often run by Catholic religious orders, included schools, orphanages, hospitals, children’s homes or any other institutions where children were in the care of nonfamily members. More than 3,100 people testified before the commission over the years. The commission’s first chairwoman, High Court Justice Mary Laffoy, resigned in 2003, complaining of lack of cooperation from civil servants. Ryan complained that the Irish Christian Brothers were trying to censor the commission’s work by launching a court case attempting to prevent publication of the names of those accused, whether they were alive or dead. The Christian Brothers ran most of the institutions that cared for young boys and male teenagers. In 2004, a month after the commission agreed not to name names in its final report, the Christian Brothers revealed that they had found in the order’s Rome-based archives details of 30 canonical trials of brothers who had allegations of child abuse proven against them.